When Damaris Ronkanen makes a steaming cup of hot chocolate- or chocolate, as it is simply known in Spanish- it takes her back to her childhood, when she would spend time visiting her grandmother in Puebla, Mexico. Damaris has always loved chocolate. Her favorite memory of visiting her family in Mexico was in the mornings, when her grandmother would make hot chocolate for breakfast. She takes pride in the fact that Mexico was the first place where chocolate was introduced into Western Culture, and the way it is woven into the region’s history. 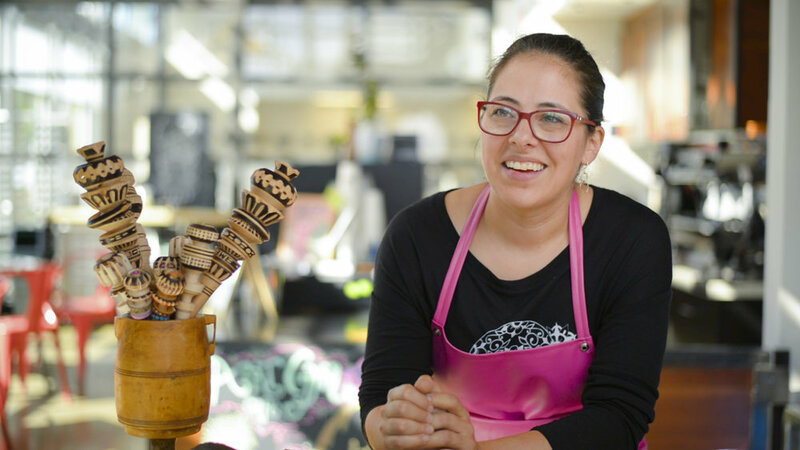 At the heart of her business, Cultura Craft Chocolate, is the preservation of chocolate “like abuelita’s” mixed with sustainable and ethical practice in every step of the process. Over the past few years, Damaris has had the opportunity to visit many of the cacao farms that supply to her. To be able to observe the process, from trying to pulp inside of raw cacao to knowing who is roasting the beans, is eye-opening and important in her business practice. Notably, she recently visited farms in Haiti, where many of the farmers are women smallholders who are empowered through the industry. In the same way, Damaris supports Re:Vision because of the way food and urban farming are used to empower the local community and preserve the historic Latino culture of Westwood. She admires the way the Westwood Food Co-op encourages the community to come together, and the fact that people are able to grow their own food in the neighborhood. Damaris is passionate about the diversity and importance of Mexican food. Mole is especially fascinating, because each town and region has their own spin on it. She loves it when people are surprised by the taste and variation of the dish, and loves to think of new ways of sharing it with her friends, such as putting it on pizza. For Damaris, hosting her friends to try new foods is a community builder and a form of creative expression of her culture and personality. At BUEN PROVECHO, Damaris will be preparing her renowned hot chocolate along with churros, because in her wise words, “who doesn’t like fried dough with cinnamon on it? !” Don’t miss her on October 13th!